CARLSBAD – The New Mexico Department of Game and Fish is offering a special hunter education camp where youths can receive hands-on training and earn their hunter education certification. The camp is open to youths ages 11 to 18 who are accompanied by a responsible adult. It will be conducted the weekend of March 18 – 20 at historic Camp Washington Ranch near Carlsbad. Lodging and meals are free and all equipment is provided. Participants must complete and return the registration form available at www.wildlife.state.nm.us/education/hunter-education/ by 5 p.m., Feb 26, to be eligible. Slots will be filled on a first-come, first-serve basis. The department is hosting the camp in partnership with the New Mexico Youth Conservation Foundation, the Safari Club International Southern New Mexico Chapter and Safari Club International Foundation. Participants will learn safe and responsible firearms handling, ethical hunting behaviors, conservation, wildlife identification and basic survival skills. Participants also can test their marksmanship skills with .22 rifles and archery on a range under the supervision of certified hunter education instructors and department staff. To qualify for the camp, youths must have a Customer Identification Number account with the department and complete the required homework before attending. 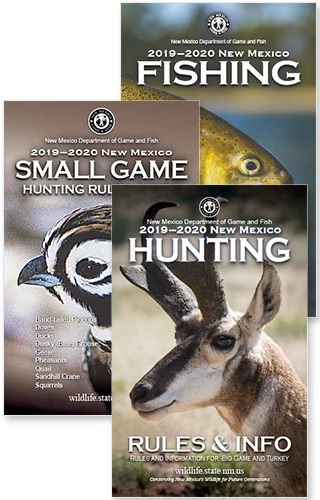 To hunt legally in New Mexico, youth under 18 years of age must first successfully complete a hunter education course or be registered in the department’s Mentored-Youth Hunting Program. For more information please contact the Hunter Education Program at 505-222-4731 or go online to www.wildlife.state.nm.us/education/hunter-education/.